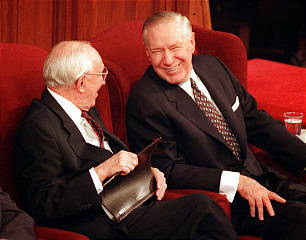 Mormon Wookiee: #126: Final General Conference Talks of the Apostles. 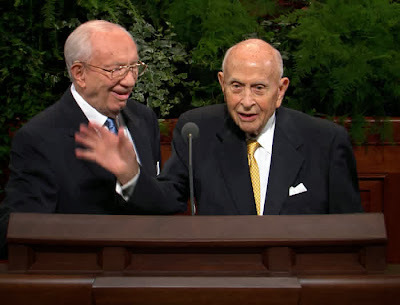 #126: Final General Conference Talks of the Apostles. 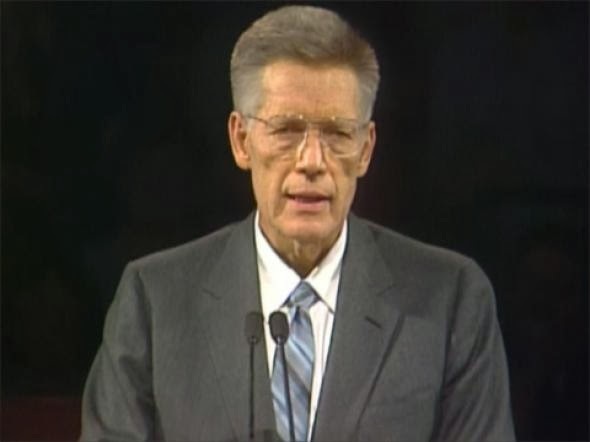 The final general conference talk of Elder Bruce R. McConkie, "The Purifying Power of Gethsemane", was given on April 6, 1985, just 13 days prior to his death on April 19, 1985. Due to the clear and powerful testimony of Jesus Christ he gives in the talk and due to its proximity to his death, "The Purifying Power of Gethsemane" is remembered by Latter-Day Saints as one of the most beloved talks ever given. 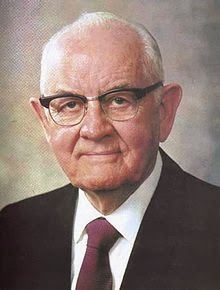 Every time I hear or read his concluding words, they stir my soul: "As pertaining to Jesus Christ, I testify that he is the Son of the Living God and was crucified for the sins of the world. He is our Lord, our God, and our King. This I know of myself independent of any other person. I am one of his witnesses, and in a coming day I shall feel the nail marks in his hands and in his feet and shall wet his feet with my tears. But I shall not know any better then than I know now that he is God’s Almighty Son, that he is our Savior and Redeemer, and that salvation comes in and through his atoning blood and in no other way. God grant that all of us may walk in the light as God our Father is in the light so that, according to the promises, the blood of Jesus Christ his Son will cleanse us from all sin. In the name of the Lord Jesus Christ, amen." As I have pondered Elder McConkie's final talk, I became curious about the final talks given by other Latter-Day apostles. Below is a reverse chronological look into the final talks given by all of the apostles who have passed away since Elder McConkie. I love and admire these men so much. Reading their final talks has brought back many wonderful memories, and I recommend them to everyone. Elder Joseph B. Wirthlin - "Come What May and Love It" (October 2008) given 2 months prior to his death on December 1, 2008. "Although my mother has long since passed to her eternal reward, her words are always with me. I still remember her advice to me given on that day long ago when my team lost a football game: 'Come what may, and love it.' I know why there must be opposition in all things. Adversity, if handled correctly, can be a blessing in our lives. We can learn to love it. As we look for humor, seek for the eternal perspective, understand the principle of compensation, and draw near to our Heavenly Father, we can endure hardship and trial. We can say, as did my mother, 'Come what may, and love it.' Of this I testify in the name of Jesus Christ, amen." President Gordon B. Hinckley - "The Stone Cut Out of the Mountain" (October 2007) given 4 months prior to his death on January 27, 2008. 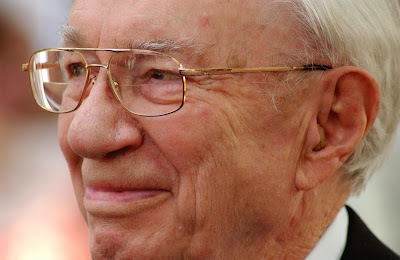 President Hinckley also gave brief closing remarks to wrap up the Sunday Afternoon session of the conference, but I consider "The Stone Cut Out of the Mountain" given during the Sunday Morning session to be his final full talk. "Scholars not of our faith, who will not accept our singular doctrines, are puzzled by the great unrolling of this work, which is touching the hearts of people across the earth. We owe it all to Joseph the Prophet, the seer and the revelator, the Apostle of the Lord Jesus Christ, who was foreordained to come forth in this generation as an instrument in the hands of the Almighty in restoring to the earth that which the Savior taught when He walked the roads of Palestine. To you, this day, I affirm my witness of the calling of the Prophet Joseph, of his works, of the sealing of his testimony with his blood as a martyr to the eternal truth. Each of you can bear witness of the same thing. You and I are faced with the stark question of accepting the truth of the First Vision and that which followed it. On the question of its reality lies the very validity of this Church. If it is the truth, and I testify that it is, then the work in which we are engaged is the most important work on the earth. I leave with you my testimony of the truth of these things, and I invoke the blessings of heaven upon you. May the windows of heaven be opened and blessings showered upon you as the Lord has promised. Never forget that this was His promise and that He has the power and the capacity to see that it is fulfilled. I so pray as I leave my blessing and love with you in the sacred name of our Redeemer, even the Lord Jesus Christ, amen." 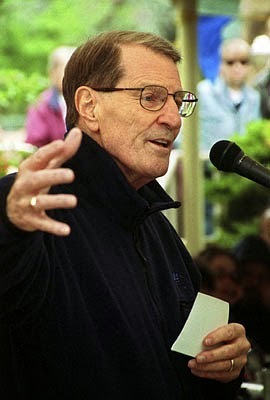 President James E. Faust - "The Healing Power of Forgiveness" (April 2007) given 4 months prior to his death on August 10, 2007. "When tragedy strikes, we should not respond by seeking personal revenge but rather let justice take its course and then let go. It is not easy to let go and empty our hearts of festering resentment. The Savior has offered to all of us a precious peace through His Atonement, but this can come only as we are willing to cast out negative feelings of anger, spite, or revenge. For all of us who forgive 'those who trespass against us,' even those who have committed serious crimes, the Atonement brings a measure of peace and comfort. Let us remember that we need to forgive to be forgiven. In the words of one of my favorite hymns, 'Oh, forgive as thou wouldst be e’en forgiven now by me.' With all my heart and soul, I believe in the healing power that can come to us as we follow the counsel of the Savior 'to forgive all men.' In the name of Jesus Christ. Amen." 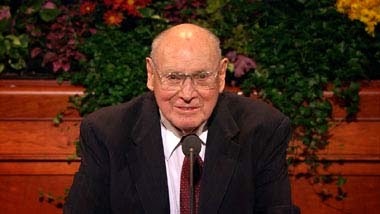 Elder David B. Haight - "How Great the Wisdom and the Love" (April 2004) given 4 months prior to his death on July 31, 2004. "We chose to come here. And so we’re here assembled in this vast auditorium, where we can speak to each other and bear witness and bear testimony. I assure you that in those sleepless nights that I’ve had at times, when you attempt to solve all of your problems and to make new resolutions of things that need to be done, I have had those heavenly thoughts that lift us. God our Heavenly Father loves us, as we should love Him. He selected His Son to come to earth and bring the gospel of Jesus Christ, for whom this Church is named and which we bear witness to. I am honored to stand and bear witness today of the foundation of this Church and of our love for President Hinckley, who leads us today. The gospel is true. I know it; I’m a witness of it. In the name of our Lord and Savior Jesus Christ, amen." Elder Neal A. Maxwell - "Remember How Merciful the Lord Hath Been" (April 2004) given 4 months prior to his death on July 21, 2004. "Brethren, as you submit your wills to God, you are giving Him the only thing you can actually give Him that is really yours to give. Don’t wait too long to find the altar or to begin to place the gift of your wills upon it! No need to wait for a receipt; the Lord has His own special ways of acknowledging. I testify to you that God has known you individually, brethren, for a long, long time. He has loved you for a long, long time. He not only knows the names of all the stars; He knows your names and all your heartaches and your joys! By the way, you have never seen an immortal star; they finally expire. But seated by you tonight are immortal individuals—imperfect but who are, nevertheless, 'trying to be like Jesus'! In His name, even Jesus Christ, amen." 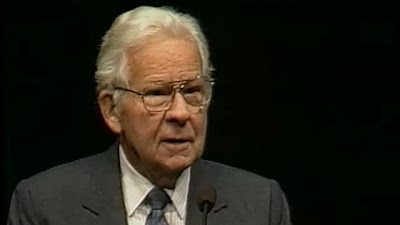 President Howard W. Hunter - "Follow the Son of God" (October 1994) given 5 months prior to his death on March 3, 1995. "And now, my beloved brothers and sisters, through the power and authority of the priesthood vested in me and by virtue of the calling which I now hold, I invoke my blessings upon you. I bless you in your efforts to live a more Christlike life. I bless you with an increased desire to be worthy of a temple recommend and to attend the temple as frequently as circumstances allow. I bless you to receive the peace of our Heavenly Father in your homes and to be guided in teaching your families to follow the Master. I again testify that the restored gospel of Jesus Christ is true. I feel very deeply my dependence on the Lord for the guidance and direction of his kingdom. I thank you again for your sustaining vote and your faith and prayers in behalf of myself and my Brethren, and I do so in the name of Jesus Christ, amen." 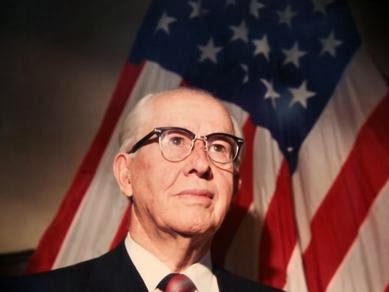 President Ezra Taft Benson - Due to his declining health, President Benson's actual last general conference talk ("To The Elderly of the Church") was given in October 1989, almost five years prior to his death on May 30, 1994. 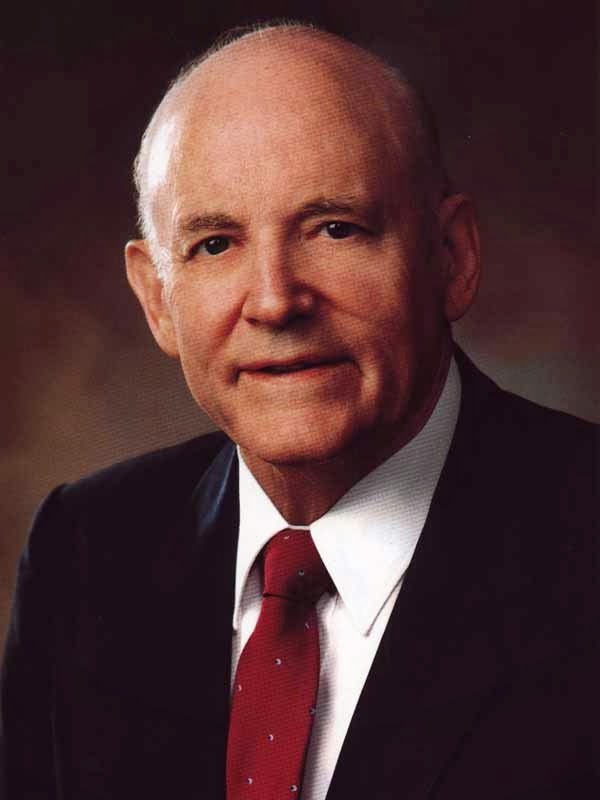 However, in the April 1994 General Conference, President Thomas S. Monson gave a talk titled "What He Would Have Us Do" (April 1994), in which he mentioned what he thought President Benson would say if he could have been there. "When we have a yearning and don’t know what it is for, perhaps it’s our soul longing for its heartland, longing to be no longer alienated from the Lord and the pursuit of something much higher, better, and more fulfilling than anything this earth has to offer. After Joseph, youngest son of Jacob, had been reunited with his brothers, he asked them to return home to Canaan to bring his father, Jacob, to him in Egypt. As the brothers were preparing to depart, Joseph said to them simply, 'See that ye fall not out by the way.' Might our Heavenly Father have given us much the same counsel as we departed his presence to begin our earthly sojourn? May our yearning for home be the motivation we need to so live that we can return to our heavenly home with God our Father on a forever basis, I humbly pray in the name of Jesus Christ, amen." President Marion G. Romney - "Unity" (April 1983) given 5 years prior to his death on May 20, 1988. "Surely we need this unity and this strength in this day in which we live. We have a great opportunity, the opportunity to rise heavenward, to gain the spirit of the gospel as we have never enjoyed it before. This we can do by developing among us that unity required by the laws of the celestial kingdom. If, in the expediency of the moment, we set God aside to follow the teachings of men, we disown him. Only a united people, keeping God’s commands, can expect the protection which he alone can give when the floods come, and the rains descend, and the winds blow, and beat upon our house. It is my conviction that, since we are engaged in the Lord’s work, we can accomplish everything he requires us to do if we will but be united. That we may so be, I pray, in the name of Jesus Christ, amen." 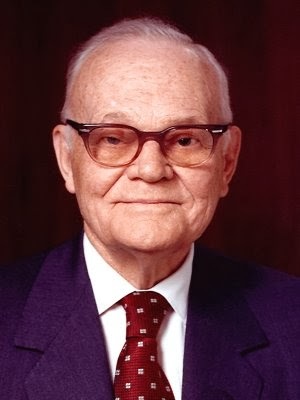 President Spencer W. Kimball - "The Lord Expects Righteousness" (October 1982) given 3 years prior to his death on November 5, 1985. "For the past century and a half since the Restoration, beginning with the Prophet Joseph Smith, the latter-day prophets of God have raised their voices in clarity and with authority and truth as they have borne their testimonies of the divinity of this great latter-day work and the redemptive power of the gospel of Jesus Christ. To the testimonies of these mighty men I add my testimony. I know that Jesus Christ is the Son of the living God and that He was crucified for the sins of the world. He is my friend, my Savior, my Lord and my God. With all my heart I pray that the Saints may keep His commandments, have His Spirit to be with them, and gain an eternal inheritance with Him in celestial glory."